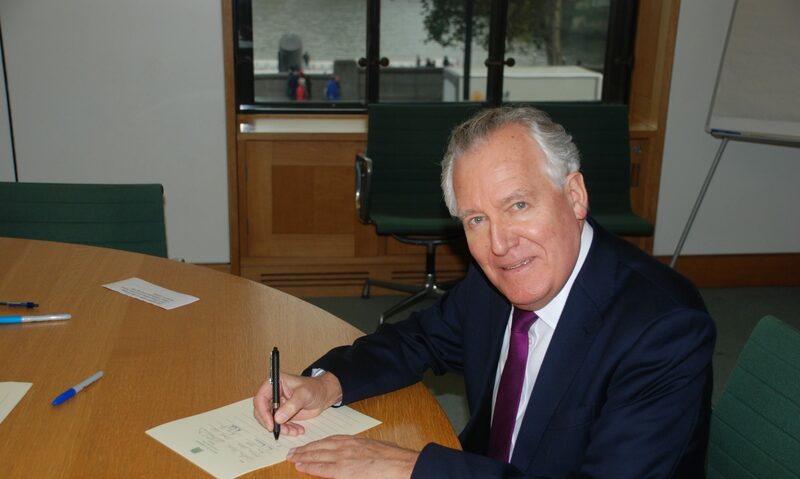 Mr Peter Hain (Neath) (Lab): Thank you, Mr Streeter—it is a delight to see you in the Chair. Like others, I congratulate the hon. Member for St Ives (Andrew George) on securing the debate and on the work that he, along with others in the room, has done with the all-party group on global tuberculosis, of which I am a member. As I declared in the Register of Members’ Financial Interests, I visited South Africa in February 2012 with the charity Results UK, which does such important work on one of the most important questions in global health today: how do we move from struggling to control the world’s deadliest diseases to eliminating them? We can control diseases such as TB and HIV, but they continue to represent a terrible burden on individuals, families and communities across the world. In the 90 minutes of this debate, nearly 500 people will lose their lives from just those two diseases. I am the chair of trustees of a remarkable charitable organisation called the Donald Woods Foundation, in Nelson Mandela’s impoverished homeland of the Transkei, in the Eastern Cape, in South Africa, where it is battling to control the twin epidemics of TB and HIV and to strengthen health services in remote, rural communities. It works closely with the South African Department of Health, and it has screened 150,000 people for TB. It also has nearly 10,000 people on HIV treatment, and it supports outreach to those who would otherwise not be reached. In addition, it has pioneered clinic design for infection control and TB testing. Despite the huge and highly commendable efforts of the South African Government and of civil society organisations such as the DWF, South Africa continues to battle enormous health challenges, one of the most significant of which is drug-resistant TB. In one small sub-district last year, the DWF reported 49 cases of extensively drug-resistant tuberculosis. XDR-TB has evolved to be resistant to our best drugs, and the few treatments that remain are old, toxic and associated with terrible side effects. Treatment success with XDR-TB and multidrug-resistant TB—MDR-TB—is rare. The drugs involved, taken over years with daily injections, steadily destroy quality of life, often leaving patients with permanent disabilities. The burden of treatment is so heavy that many patients choose to default—to give up—and they discharge themselves from hospital rather than continue with what are, essentially, useless drugs that are causing them pain. I have met people with XDR and MDR in South Africa, and their examples are tragic. I remember the story of a girl who had been confined in a hospital ward for more than two years. The drugs made her physically sick practically every day, she was losing her hearing because of them and her liver was being destroyed by the disease—TB ruined her life. Before the disease, she was doing well in school, and she had a bright career ahead of her, as well as close friends and a good family, but then the disease struck. Eventually, I am sorry to say, she discharged herself from hospital, knowing that, in doing so, she was most likely surrendering her chances of surviving. She returned to her family home, but it was empty—both her parents had died from the same disease. Soon, she also passed away—pale, sick, deaf and alone. Sadly, that is not an isolated story. South Africa has the highest rate of TB in the world, and behind the statistics are thousands of tragic, grim stories. The worst cases are in gold mining. The deep gold mines are a source of a tremendously lethal form of TB, with all the consequences that brings. Progress is being made against TB and HIV, but it is far too slow. The diseases continue to ravage health systems across southern Africa. Only 2% of South Africa’s TB burden is drug resistant, although that number is increasing, but that 2% accounts for fully 32% of the national budget for tackling TB. Our weapons against these diseases are becoming less effective with every passing day, and I am struck by the similarities between drug-resistant TB and antimicrobial resistance, which was such a topic for conversation last week, with the Prime Minister launching his own special commission. We need new drugs that the TB bacteria have not already encountered, and we need a vaccine that kills or prevents infection so that resistance never gets the chance to develop. We need to remember that we have TB here in the UK and that a small but growing percentage of cases in the UK are drug resistant. When drugs are developed, they must be affordable. Of course, commercial sector organisations must generate a profit, and developing a new drug can cost hundreds of millions of pounds and take years of sustained effort and research. None the less, while we want to find a way to unlock a new generation of drugs for diseases such as TB, we must not find ourselves in a situation where the poorest people cannot afford treatment or where the cost of buying drugs cripples local health services in poor countries. What is required, then, is an alternative model—one that separates the requirement to generate a profit from the direction of research and that separates the cost of research from the price of the final product. Such a model, which is often described as de-linked, is the only way we will be able to encourage research and development for diseases for which there are no significant financial markets and to ensure that the products that are developed are accessibly priced. Will the Minister therefore commission a report examining the costs and implications of commercially driven development, as against de-linked development models, and use the findings to make the case to other Governments? Perhaps he could respond to that request in his reply. We know that the system is not working; we know that the imperative to act and to find solutions to these problems is as strong as ever, and we know that the challenge of correcting market failure will dictate the future of efforts to control humankind’s deadliest infectious killers, yet we are no closer to breaking the deadlock. For the sake of the world’s poorest, our own national health service and, ultimately, our health in this country—these diseases are very infectious—I ask that DFID champion alternative, non-commercial models of development and thus help to develop the new drugs, vaccines and diagnostics that will help us to see the end of TB, HIV and malaria in our lifetimes.